Funny, odd, surprising and touching, Seven Psychopaths is a movie that’ll keep you guessing. Writer-director Martin McDonagh’s followup to his acclaimed In Bruges, which also starred Colin Farrell (Horrible Bosses), Seven Psychopaths mixes the stories of screenwriter Marty (Farrell), who’s behind on his deadline for his latest script, called, coincidentally, Seven Psychopaths; Marty’s friend Billy (Sam Rockwell, Cowboys & Aliens), who kidnaps dogs for reward money and has a penchant for cards and blood; Billy’s partner Hans (Christopher Walken, Catch Me If You Can), whose wife is in hospital getting treatment for cancer; and Charlie (Woody Harrelson, The Messenger), the gun-toting gangster whose dog is kidnapped by Billy. And, of course, a bunch of psychopaths. Veteran playwright McDonagh has a knack for witty dialog (he picked up an Oscar for his deliciously twisted 2004 short film Six Shooter), and he supplements it nicely with twists and surprises. Other than a couple slow-ish scenes, the film moves forward quickly, showcasing great acting from the cast. The standout, naturally, is Walken, who’s always brilliant, but especially as the sweet, quiet Hans. And who doesn’t love a charismatic shih tzu? The movie has violence, shootouts, and lots of blood, but it’s blended with heart, in the stories of Hans and his wife, fellow psychopath Zachariah (Tom Waits, The Book of Eli) and his estranged love, Billy and his respect of Hans and Charlie’s do-anything mission to get his dog back. 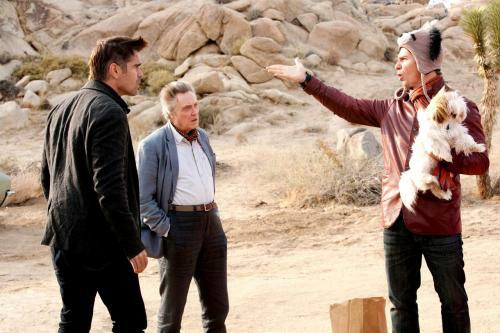 Although not the kind of film with gorgeous sweeping landscapes, Seven Psychopaths looks great in Blu-ray’s high-definition, and the 5.1 DTS-HD audio delivers the gun shots and blood splatters beautifully. The special features menu isn’t too plentiful, offering a handful of promotional featurettes that are only a few minutes each. But the “Seven Psychocats” trailer, which swaps the actors for cats, is a must-watch.